Gen Xtinct: Funky Food Friday: Farrell's vs. Shakey's -- take a side! Funky Food Friday: Farrell's vs. Shakey's -- take a side! OK, on this Funky Food Friday, we have a good old-fashioned food fight: Farrell's vs. Shakey's, pick a side! You remember Farrell's, the ye olde fashioned ice-cream parlour, right? They had ginormous ice-cream sundae-type treats called The Zoo, The Trough, and other inedible item names. It was screaming booming birthday-party mania, wrapped in barbershop-quartet type design. And then they ... vanished. But all is not lost! According to this site, there are four working Farrell's left in the U.S. One just opened, in Mission Viejo, California. And company founder Bob Farrell, who opened the first-ever Farrell's in Portland, Oregon in 1963, is planning a new location in the town where it all began. Now I may be the only one, but I always cross-associate Farrell's with Shakey's Pizza. Come on! Both were everywhere chains, both were noisy as heck, both were beloved by kids for birthdays, and kind of tolerated by parents. Apparently there are still 50+ Shakey's left in the U.S., with most of them in California. Fun fact: Wikipedia claims the name of the chain came from the malaria-caused nerve damage that gave the founder the nickname "Shakey." Well, way to turn a negative into a positive, no? Since I liked ice cream better than pizza (still never quite took to pizza, I know, blasphemy! ), I preferred Farrell's. But since I was kind of a nerdy kid who didn't really like BOOM BOOM POW loud places, I was not a giant fan of either. What about you? Shakey's or Farrell's, what's your pleasure? Share any memories of both or either in the comments! I live in Southern California and drive by a Shakey's occasionally. Can't figure out why they're still around, really - LOUSY pizza! I never associated them with Farrell's, though. I LOVED Farrell's. It was one of our favorite hangouts during high school. A couple of the remaining ones are in my general vicinity, and we keep meaning to check one out, but never get around to it. We lived in San Angelo, TX, when I was a kid in the '80s, and we a Shakey's there (it shut down years ago). I had my 6th birthday party there! We didn't have a Farrell's, so I can't compare them. At Shakey's, I liked to sit in the room with the big projection screen where they showed cartoons and Three Stooges shorts all the time. 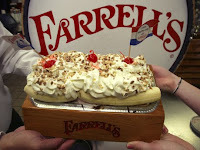 I'll say Farrell's, though I didn't really like either. The ice cream was better than Shakey's terrible pizza. Like you said, both were way to loud to be enjoyable. My wife has nightmares about Farrell's to this day. My brother and I have the same birthday. In the early 70's Shakey's would give you a free pizza on your birthday. So my budget conscious parents would take us there, get 2 free pizzas, and be well fed. We also had that frisbee. Oh, and Shakey's used to have peanut shaped balloons with a mustachioed man printed on them and you could slip the tied off end into cardboard shoes so he could stand. We loved those balloons.